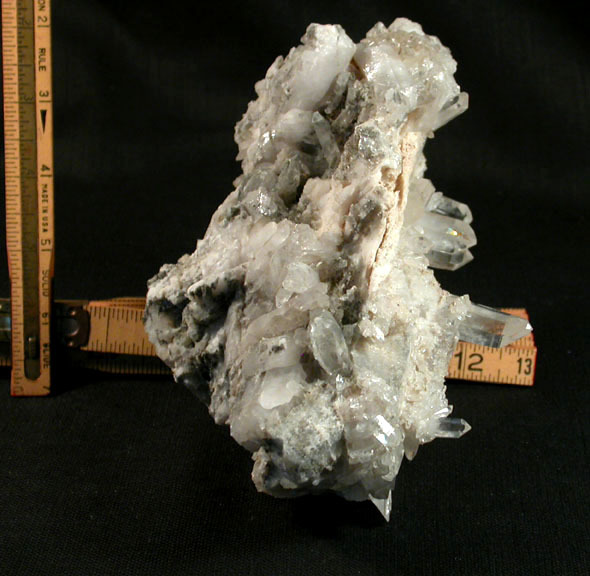 What attracted us first to this cluster is that it grew on a 'vein line' - one side has blue inclusions and two or three faint rare phantoms [black manganese], the other side is all white. Then we noticed the phenomenal textural quality of the piece: roots and a screen-like portion on the white side, stalactite type growth and a painterly quality to the occluded [surface] manganese on the blue side. And of course, the crystals themselves! The largest single point, is 1/2x 2" with an uncommon 7th face, very clear. Twins, tabular crystals and more crystals with rainbows, natural etching and extra faces. Safely self-displays as shown, with a milk quartz matrix. 5x >4 1/4x 6 1/2" high with enough nooks and crannies to keep you plenty busy, 2 small chips noted, record keepers, too. Sent gift boxed with hand written description on the reverse of our enclosure card - we will ship insured parcel post to save you money on weight. Shipping will be added.